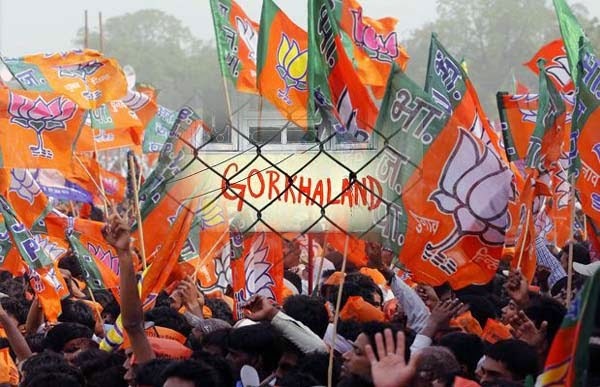 Right under the shadow of BJP top policy maker's strong advocacy in favour of separate Gorkhaland statehood for Darjeeling in West Bengal, the party state committee leaders are keen on showing their anti separatist image. Needless to say, BJP wants to churn out electoral benefit from Gorkhaland movement in hills and foothills. But, while remaining good to common mass of the whole state that is largely against the separatist demand. BJP National Executive Committee member and think tank Mr. Subramanian Swamy has written to Union Home outlining various aspects for the formation of the demanded separate state as he promised during his recent speech at Darjeeling favouring the statehood demand. As expected, the move has made Gorkha Janamukti Morcha, the party that is spearheading Gorkhaland movement, overwhelmed. "It proves how strongly BJP at topmost level supports our Gorkhaland dream," said GJM President Mr. Bimal Gurung. But, "We never advocate any split within Bengal," said BJP State President Mr. Rahul Sinha more than once to prove state BJP's stand point against the statehood movement. Interestingly, BJP top leader and MP from Darjeeling Mr. S. S. Ahluwalia always remains too supportive to GJM and Gorkhaland when in Darjeeling hills. But he maintains silence on the statehood issue after he comes down to Siliguri, the nearest city in plains within Darjeeling constituency. Demographic share of Gorkha community, the main supporter of GJM, is over 60% in Darjeeling parliament constituency and adjoining areas. In addition, around 6 other assembly constituencies in foothills are also strong holds of GJM. "Despite very week political strength in Darjeeling constituency Mr. Ahluwalia could win there because of GJM's support. In the same way, BJP wants to gain strongly positive electoral outcome in all these assembly constituencies of hills and foothills in 2016 assembly election by showing its Gorkhaland friendly look," said Political observers. But, "The party cannot afford to antagonize common voters of other more than 400 assembly seats in the state where GJM is non entity and common mass is largely against Gorkhaland movement. Thus it is showing different face there through its state committee."